Barack Obama has just finished his Inauguration speech. Here is a Wordle tag cloud for it - the bigger the word the more often it was used. 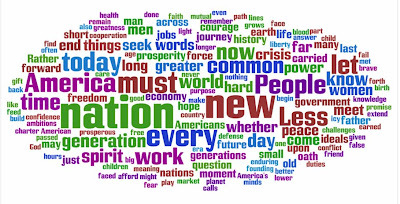 'New' and 'Nation' being the most popular words in the Inaugural address. Link to Wordle Gallery here. Based on the text from Time Magazine online.